When I initially got this top this past fall, I envisioned quite a few different outfit combinations that were possible with it. The dark background with many different colors makes it very versatile without being overwhelmingly floral (there is no "Grandma's couch effect). I last paired it with grey pants here, but wanted to try a color this time. 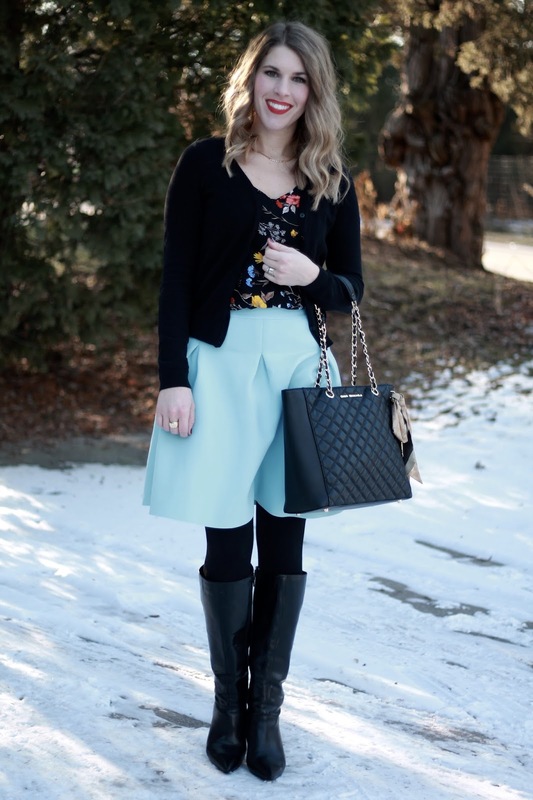 This light blue skirt really brings out the blue flowers in the floral pattern. As the weather warms up I am looking forward to pairing it with my yellow skirt and coral blazer! love this pretty and ladylike look. I love the mix of dark and light colors in this look! The contrast of the blouse and skirt is gorgeous! That skirt is such a pretty color! You did a great job styling it for winter with all of the black and will be so perfect for spring and summer too. Great choice! This outfit is everything!! Love the contrasts of light and dark, and the gorgeous blue skirt. AWESOME!! I do love pastels with the darker colors---it's such a fabulous contrast!! Cannot believe you are still standing in snow. Bless your heart. Your outfit is lovely. I am seeing a lot of pleated skirts this spring. Love your pretty blue one. Oh my gosh! I love this combination so much! The contrast between the black and light blue is beautiful! That skirt is beautiful. I simply love the color!! 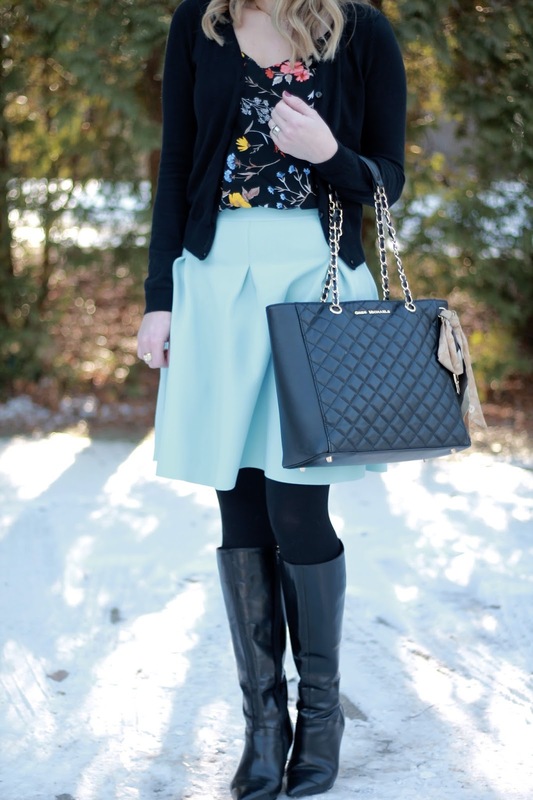 The baby powder blue skirt is so charming ! I'm all about that floral top! I love the bright blue skirt paired with it! The blouse looks so pretty with that skirt! Dark florals seem like such an obvious choice for fall, but I love seeing them work for spring as well! We didn't get much snow here in STL this year and I always love my snow outfit photos. The snow really makes this outfit pop. 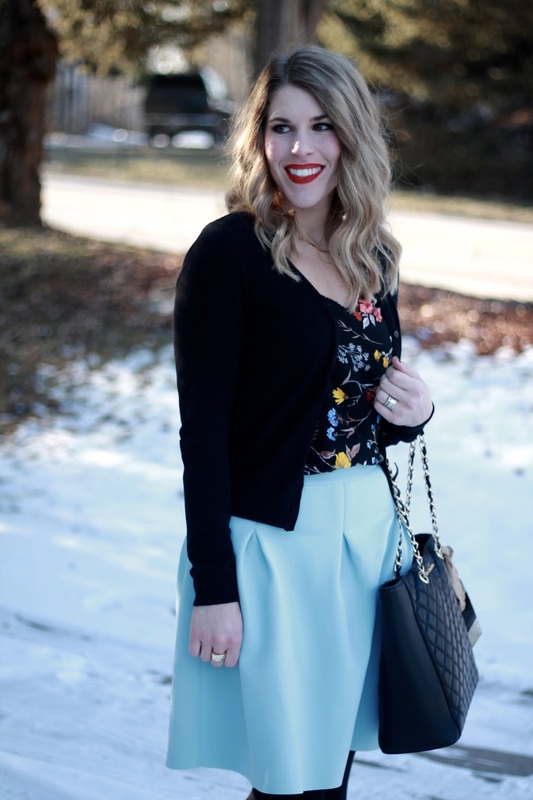 I just love the baby blue skirt with the darker floral print on top!